Imagine living in this house! And imagine how much better it is since Outside Concepts Gold Coast South added the deck and roof! This innovative multi-level skillion roof features Bondor Solarspan, an insulated roof panel. 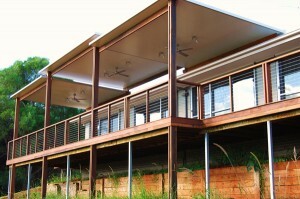 Bondor Solarspan is a panel of polystyrene sandwiched between a Colorbond roof sheet and a Colorbond ceiling sheet. This clever combination ensures your deck stays dry as condensation is elimated due to the insulation properties of the panel. 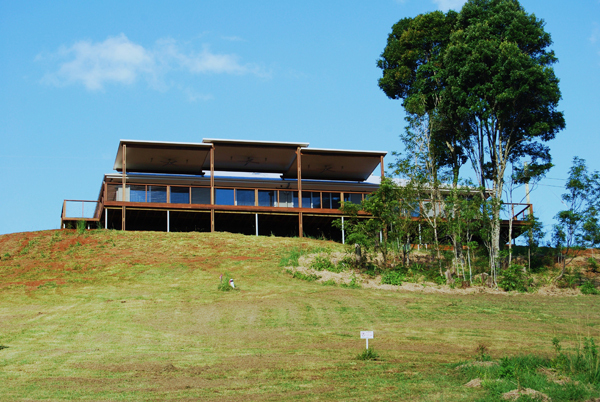 Used to perfection here the multi- levelled roof provides not only high-level aesthetic appeal but also ensures good air circulation as heat can easily escape as it rises. Fans and outdoor lights complete the picture. To ensure longevity of the framing timbers a joist protector has been applied. This is a rubber membrane which is laid across the top of the joist so water doesn’t sit on the joist under the decking boards. Unless prevented this will cause the joists to rot and deck failure can result. Spotted Gum hardwood has been used in framing and decking as it complies with fire safety standards, is an Australia forest grown product and stains to a brilliant warm red-brown. So don’t just imagine a spectacular deck in your home, call us today and make your dream come true!